I just finished The Book Thief last night. It had recieved some high praise on the internet so I was hoping it would live up to the hype. It did. The book is about Liesel Meminger, who at only 9 years old, is taken to the live with the Hubermanns, a foster family, on Himmel Street in Molching Germany, in the late 1930's. She arrives with few possessions, but among them is The Graeve Digger's Handbook, a book stole from her brothers burial place. 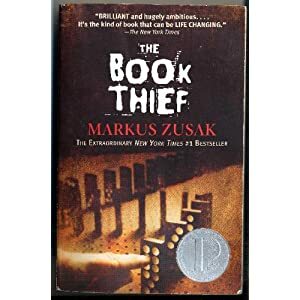 During the years that Liesel lives with the Hubermanns, Hitler becomes powerful , live on Himmel Street becomase more fearful, and Liesel becomes a full-fledges book thief. She rescues books from Nazi book burnings and steals from the library of the mayor. Liesel is illiterate when she steals her first book , but Hans Hubermann uses her prized books to teach her to read. The book is a story of courage, friendship, love, survival, death and grief. The book is Liesel's life on Himmel Street, told from Death;s point of view. Again, this book had me sucked in from the beginning. As I was nearing the end, I was sad that it would be over soon. I also had a scene played out in my mind of how the book would end. That didn't happen. The ending was good and had a couple of surprises. Overall Rating: 5 out of 5. I can't believe it! I am reading this at the moment- i am only about 20 chapters in but i am also sucked in. Great book. What are you reading next Krystal? I loved this book. Best book I have read in a while. I am only a couple chapters away from the end of Columbine, which is also very interesting. Hopefully I can finish it before the weekend and get a review up here.